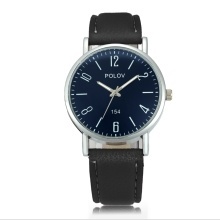 Alloy case and PU leather strap, strong and durable. Quartz movement, precise time with highly visible second hand. Lightweight and adjustable band, convenient to wear. Hardness watch case is made of glass, which makes the watch scratch resistant and easy to read time. Simple design watch can match with different dress style perfectly and add style to your life. Please avoid using it in extreme hot or cold temperature.